Although I wrote everything I know about squirrel issues for this website, oftentimes a problem with squirrels in the attic is beyond the scope of the do-it-yourself homeowner to solve. I have found a professional company in Providence, Rhode Island that handles problems with wildlife. Bay State Wildlife has access to tools, techniques, and experience that help them do a far better job at wildlife removal than a non-experienced homeowner could. They possess licensing that allows them to do certain types of work legally, that non-licensed homeowners in the state of Rhode Island are not allowed to do. For the welfare of your situation, and the squirrels, in some cases it's best to hire a pro. There are good companies and bad companies out there. I've done research on such companies, to get to know them, and feel confident recommending their services. I therefore recommend a company called Bay State Wildlife which services Providence, Rhode Island. If you have a squirrel problem, or any other conflict with a wild animal, and live in Providence, I am confident that this company, Bay State Wildlife, is the one to call. I asked the company to describe their service range, and they said this - We also provide wild animal control in these surrounding towns: Cranston, Warwick, Johnston, Central Falls, Pawtucket, Barrington, Warren, Bristol, West Greenwich, East Greenwich, Coventry Bay State Wildlife operates 24/7, so don't hesitate to call at any time to discuss your wildlife problem, and schedule an appointment for same-day or next-day service. Hi David, I am an fairly new to the US (from England) and the whole wildlife scene has taken me by surprise! I have a contract with a pest control company who deal with the everyday mice and wasps etc....but I now think I have a flying squirrel in my loft. The pest control company don't deal with this aspect and recommended a wildlife expert. I used this man last year but frankly was disappointed, he came into the house, inspected it and set rat traps. I had actually seen the flying squirrels in the house, they were in my family room so we knew what we were dealing with. However the rat traps did not work and in fact my husband and I watched as a flying squirrel sat on the rat trap and ate the bait! As the wildlife expert had charged me $150 I wasn't in a rush to call him again. With advice from friends we got a humane trap and in the space of 2 weeks caught 3 flying squirrels. (2 on the first night) All of them were in our master bedroom. We even had them jumping on us in the night!! It was pure situation comedy and have dined out on the story for 6 months!! But I think I have one back again this season ( the above story relates to this time last year). We are being kept awake at night with the noises above our head in the ceiling close to the exterior wall. I can hear what sounds like nuts being rolled around and I hear scuttling and scraping. This area is also close to the soffits. This is different to last year as then they were in the house and proved easier to remove but this guy is inaccessible to a humane trap. I'm concerned that when I call out a pro I'll be charged huge amounts and they won't get rid of the problem. Can you advise please? I found your website and saw that you recommend using exclusion doors for squirrels. I�ve been working with a wildlife company for about a week and after spending almost 500 dollars we still have squirrels (who I have seen exit the hole and walk right past the trap, which they set on the ground), so I am starting to look for other companies and options. I asked the company about using excluders and they said they would not because the squirrels would just chew a new hole into the porch ceiling. I am curious what your experience is with this. If you have a squirrel problem in Providence County Rhode Island, or any other conflict with a wild animal, I am confident that we can solve it. 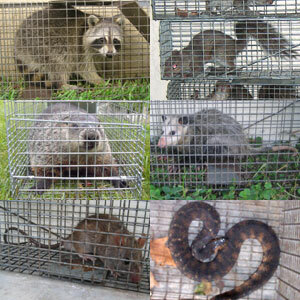 We use humane methods when dealing with Providence wildlife removal situations. Squirrel Control Providence. Our company is fully licensed and insured in Rhode Island. Call us any time at 401-223-4430 for a price quote and to schedule a same-day or next-day appointment to solve your squirrel problem in Providence.